Are we fac­ing a global “Lost Decade”? This is an invited paper by the Pri­vate Debt Project, an ini­tia­tive of the phil­an­thropic orga­ni­za­tion the Governor’s Woods Foun­da­tion to raise aware­ness about the eco­nomic impor­tance and dan­gers of pri­vate debt. 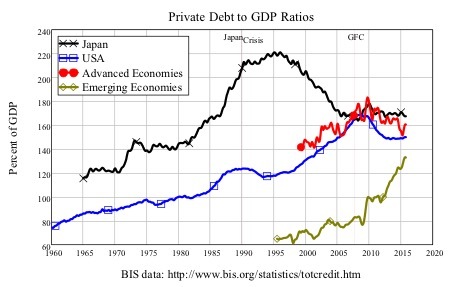 The era of low growth known as Japan’s “Lost Decade” com­menced in 1990, and per­sists to this day. While most authors acknowl­edge that the seeds for the Lost Decade were sown by exces­sive credit growth in the pre­ced­ing Bub­ble Econ­omy years, only Richard Koo (Koo, 2009, Koo, 2011, Koo, 2003, Koo, 2014) and Richard Werner (Voutsi­nas and Werner, 2011, Werner, 2002) have sys­tem­at­i­cally argued that insuf­fi­cient credit growth dur­ing the “Lost Decade” explains Japan’s now quar­ter-cen­tury long slump. Yet these argu­ments tell us more about the dilem­mas fac­ing today’s world econ­omy than many more com­monly accepted expla­na­tions of the cur­rent slow­down. Koo is, how­ever, cor­rect: it is pos­si­ble for an entire econ­omy to be bal­ance-sheet con­strained. Under­stand­ing why requires an appre­ci­a­tion of pri­vate credit cre­ation that goes beyond the mere account­ing tru­ism that every entity’s lia­bil­ity is another entity’s asset. This paper will argue that the assump­tions made by main­stream econ­o­mists about the role of credit and bank­ing in the econ­omy are incor­rect. When tak­ing into account the “money cre­ation” func­tions of bank­ing, it becomes clear that the USA and most advanced economies as well as many emerg­ing economies have joined Japan in being bal­ance-sheet con­strained, and face their own “lost decade” as a con­se­quence of low credit growth. I will start with the empir­i­cal data and its impli­ca­tions, and then move on to the argu­ment that an entire econ­omy can be bal­ance-sheet con­strained. Click here to read the rest of this paper. Debunk­ing of Petro­leum as always fos­sil ori­gin. Oil could be abi­otic. Abi­otic oil means more can be found.